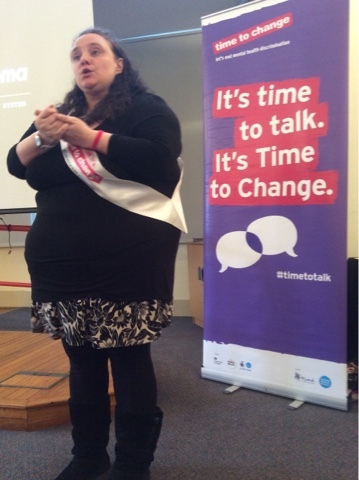 Welcome to post number two of the International Women's Day event at which Time To Change commissioned me to assume the role of Social Media and Evaluation Manager. A lot of different organisations attended the event; providing lots of information and insight through stalls, speeches and Q&A sessions. I'd heard of this amazing organisation through a website that advertises voluntary jobs and so I had a rough idea of the work they do- or at least I thought I did! 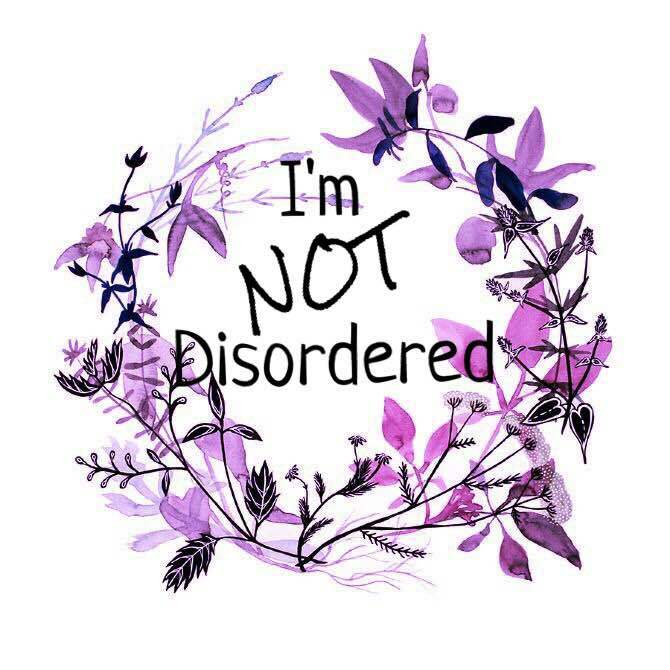 As I usually work at events centred around mental health, it was really interesting to find out about such a different kind of organisation yet realise there was still a psychological element to their work. The centre's website describes the service as a 'black-led women's centre' who 'offer a range of holistic women only services for Black and Minority Ethnic women.' 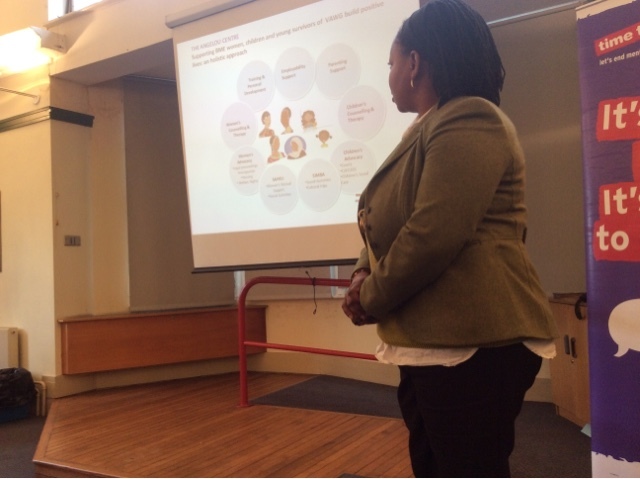 When the staff who attended the event spoke, they concentrated on the work they do around Female Genital Mutilation (FGM), which is procedures that intentionally causes injury to the female genital organs. One of the Centre's main service in this area, is in aiding women to get counselling or psychological support because many of the women who go to the Centre don't know how to access such services, and the workers aid in ensuring any counsellors or therapists are capable of supporting these women after such a unique and specific trauma. 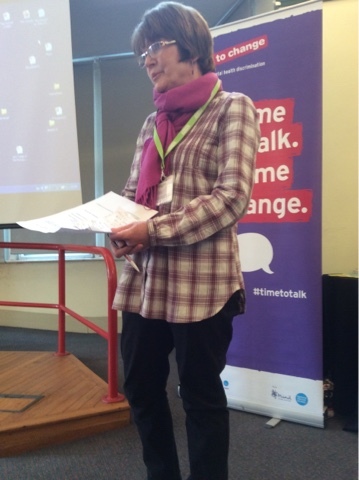 I've obviously worked with Time To Change on many occasions and so I'm very aware of their purpose and work, but I really enjoyed listening to the workshop that the Equalities and North East Regional Coordinator, Angela Slater led. It was centred around stigma (the focus of Time To Change) and asked the group what they thought 'stigma' was; it's always so interesting to hear each individual's understanding on such terms. The group were then asked what kind of affect they thought stigma could have on a person. And finally, the group were asked to think of ways in which mental health stigma can be challenged. I think that one of the most popular bits of advice for those struggling with their mental health is to call a helpline. Some of you may have noticed that I've never recommended any helplines; this is because I've only ever used just one myself so I'd feel that it'd be unfair for me to only recommend that one when there may be many others that people have found helpful but I've never accessed them. If you haven't already guessed, the helpline I used was Samaritans. The worker speaking about the services they offer, mentioned that they hoped they'd made a difference to people and I realised that they probably never found out whether they had helped those who call, so I took the opportunity to tell them that they'd helped me. I'd found them useful in that they didn't ask millions of questions. They didn't want my entire life story. And for much of the call, it was actually silent. And that helped. To know someone was there. I called with a handful of tablets, and when I hung up they were all flushed down the toilet! I think that a crucial part in the support Samaritans provide is in their confidentiality promise. You don't have to give your name, date of birth, address... Nothing. And they will never inform other services of your call; it's not traceable. This is probably one organisation most of you will be familiar with, they've funded large projects such as Time To Change and Gateshead Millenium Bridge (for those living in my region). Learning about the processes that someone has to go through in order to not only qualify but apply for a grant and funding from The Big Lottery Fund, has meant I feel better educated in something that is often questioned and been quite controversial in the media. Only the most positive and inspirational projects, who will have life-changing impacts on others, are awarded the financial support that can be crucial in making their dreams and potential come to life. The projects funded by the Lottery fund save lives. This project was an individual's brain-child; Gail Curry. Gail experienced the loss of her partner and a home burglary that left her feeling unsafe in her own home, within three months of one another. 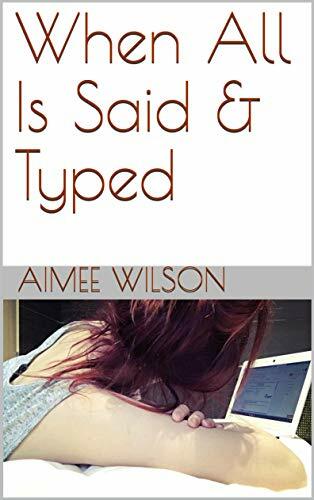 Understandably, she developed Depression, an Anxiety Disorder, and PTSD; and has spent the last two years learning to manage herself as a person with such mental health problems. 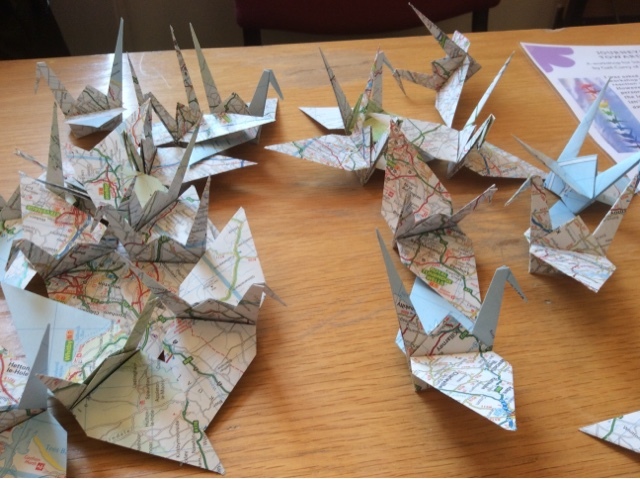 Upon realising her experience was a 'journey' that had led her to this very event, she decided to use maps to craft Origami cranes from to represent everyone's personal journey; whether they're centred around mental health or not. The traditional Japanese art of Origami- in particular cranes- give promise of eternal good fortune and recovery from illness. Gail's intentions in this project, were for people to write a message of hope/peace/recovery that when strung together and displayed, others may learn from one another's journey.